Today, we have a suggestion what you should try when you are in Prague. A true Czech classic. Only a few things remind us of our childhood more than a tray of hot, wonderfully fragrant buns prepared by our grandma. The magnificent bun is even embedded in the local mythology: whenever Honza, the smart popular hero of many Czech fairy tales, left the house to fight the dragon, break the princess' evil curse or do whatever was on the agenda that day, he always first ordered his mom to make a few buns for the road. One of the most common children's disputes was the favorite filling: plum jam? poppies? curd cheese? Our grandmas always preempted these disputes by making sure the tray included a few of each. A popular breakfast treat, the poor grandma had to wake up early in the morning to make sure the yeast dough was ready by the time we sprang out of bed. Luckily, you don't have to - you can simply stay in bed and go to one of the following places and buy them. Easy! EMA Espresso Bar: You know what is better than a great, tasty bun? A bun with a cup of great coffee! And that's exactly where EMA excels. EMA's baristas are living proof that you don't have to be a bearded hipster with inked forearms to prepare a cup of tasty coffee. Just don't sit on the bench near the entry - that's our spot! Café Lounge: EMA's older sister also serves the Czech buns. Although they may serve other sweets, we always keep coming back to the classic. Sisters: Sometimes you can find the sweet buns on the menu of this cool and lovely bistro that focuses primarily on the modern versions of the "chlebicek", the classic Czech open-faced sandwich. A perfect ending to their daily soup and one or two sandwiches. Bistro 8: For those visiting the National Gallery or the National Technical Museum, this popular hipster hangout in the heart of the Letna district is a must. Recently expanded, they may now have more space and time to bake the Czech buns more often! Always take all ingredients for the dough out of the fridge about 2 hours before you make the dough. First, prepare the starter: in a small bowl I mix the fresh yeast with a teaspoon of sugar, 3 tablespoons of lukewarm milk and a tablespoon of flour. Cover the bowl with a tea cloth and leave the dough to raise for about 30 min. In the meantime, mix other ingredients in a big bowl and when the yeast is ready, mix it in. Now comes the hard work - kneading. But don’t worry – there’s a shortcut. It’s called the kneading machine. I just like kneading the dough with my hands, I’ve always found it relaxing. Whatever way you choose, work the dough really well and let it rise for about an hour under a tea cloth in a warm place. In the meantime, preheat the oven to 170C/325F/Gas 3 and prepare the fillings. For plum jam or farmer’s cheese fillings, I simply mix all the ingredients together. For poppy seed filling, I put the milk on the stove until it’s warm and then add all the other ingredients and cook the filling until it thickens. I put it aside and let it cool down. When the dough is ready, roll the dough on a floured board into about 1cm think dough. Cut the dough into squares (about 7x7cm – 3x3 inch) and put different fillings into the center of each square. Then wrap each square together into a small bun. Put all the buns on the baking tray one next to the other and then butter them with melted butter mixed with rum. Let the buns raise for about 10 min and then put them into the oven and bake them for about 30 minutes until golden brown. When you remove the buns from the oven, butter them with butter and rum once again. When we have visitors, I usually also sprinkle them with sugar. Wherever you have the buns out or at home, enjoy! We know you will. Anyone who has talked to us or joined one of our tours knows that when we want to treat ourselves to some fine Czech cooking, we hop in our car and drive to the famed Na Pekarne restaurant headed by Mr Fryc, a force of nature both in the kitchen and in the restaurant. We have to confess: we absolutely love it there. The only problem? The restaurant is not in Prague but in Cakovicky, a small village about 20 km from Prague. Sure, you can get there within an hour from the centre by Prague Public Transport but if you miss the bus from the Letnany subway stop, you are running the risk of freezing to death while waiting for the next one. A few of our guests visited the place and loved it but we will be honest: it takes an effort to get there, which will ultimately be rewarded by fantastic Czech food, but it's an effort nonetheless. Now there is an alternative that does not require you to travel out of the town: the Kastrol restaurant. Opened in late 2013, Kastrol is a sister restaurant of Na Pekarne: the basics of the menu are nearly identical and both restaurants share some suppliers of meat. The styling is also very similar: a simple, down-to-earth Czech pub that does Czech dishes really well. There are differences, too: while Na Pekarne focuses on Czech cuisine exclusively, Kastrol is not shy to incorporate elements of foreign (and especially French) cuisines into their offerings. Most importantly, Kastrol is located in Prague, although only the bravest real estate agents with the most chutzpah would have the courage to call its location "central": Kastrol is located on the very outskirts of Prague but is still accessible by public transport. We have visited Kastrol twice recently: first with our friends of Scuk, a group of foodies behind the popular website that tracks good food around the Czech Republic and abroad, and later alone for lunch. We must confess that the first visit was a bit special: the chef knew we were coming as a group of foodies and he may have wanted to show off the restaurant's strong points. That's why we got a set menu that consisted of several tasting courses not available to the regular guest in this form. Winter is the season of meat here, so the courses really reflected that: the starters included steak tartare, head cheese and two pates. The next course was pan-seared zander with ratatouille and potato mash, followed by absolutely fantastic spare ribs with coleslaw and sourdough bread and butter with herbs. We were stuffed by the third course but we were not done yet. The next two courses were game meats: wild boar with gingerbread sauce and grilled dear. We finished with a plate of desserts and a classic that we absolutely love at Na Pekarne: potato dough ravioli stuffed with plum jam and covered with butter, sugar, nuts and gingerbread. The version at Kastrol finishes it off with whipped cream. Yes, it was a special event and the restaurant wanted to showcase what they do best but we think it was representative of what the kitchen wants to do: honest flavors in honest dishes done well. It is rare to find a Czech restaurant that just sticks to a simple concept of honest Czech cuisine without doing things that make little sense just to please everyone. We got the impression from our first visit that Kastrol is one of these rare finds. The second visit was for late lunch. The restaurant was nearly empty at that time but started to fill up as we were leaving. We ordered their table wines and were disappointed: the Pinot Gris was nothing special and the rose was way too sweet for us. That's a shame because we were offered a wine pairing with the set menu when we visited with Scuk and we know the staff is quite knowledgeable about wines. Still, beer is probably a safe bet in a Czech restaurant: Kastrol changes the brewery on a monthly basis based on their guests' online votes. For starters, we ordered potato soup with mushrooms and pate with boar cracklings. We liked both: the soup was rich and fragrant and nicely displayed the flavors of all the ingredients. The boar pate reminded us both of our childhoods spent in the countryside: a very rich and satisfying taste of the meat went well with the sourdough bread served. For the mains, we ordered the beef shank slow-cooked in red wine and served with potato mash and steamed vegetables, and grilled suckling pig with mashed potatoes and cabbage. The shank was tender and the sauce had a rich flavor, a bit on the sweet side. The pork was perfectly done and paired well with the sides. It reminded us of a dish we recently had at Bellevue, one of the most popular restaurants in town, but the Kastrol dish was actually better: where the Bellevue dish was a bit bland, the Kastrol version packed more flavor and the meat was better prepared with more moisture. We had to finish our lunch with the plum jam ravioli because not having those for dessert would be against Jan's religion. The final bill? You will be surprised by how reasonable (read cheap) the prices are when considering the quality. The whole lunch set us back about EUR 20. We definitely recommend Kastrol if you want to sample some really solid Czech cuisine and see how the locals eat their lunch or dinner. It is a bit of a ride from the centre but we think it would be a great "local experience": you will see where the people in Prague really live (hint: it's not the tourist centre) and what they love to eat. They plan to have outdoor seating for the summer months (with a grill and a smoker) in their lovely courtyard, but it can be the experience of your trip even if you visit in the winter. Opening time: daily from 11am to 10pm. Now, if you have joined us on the food and culture tour, you will confirm that one of the most popular dishes served include the potato mash at the Cestr restaurant. Yes, the simple mash blows everyone away. Why? Well, because it is not that simple. The “milk mash”, as they call it at Cestr, is a bit more difficult to prepare that your ordinary mash, but the result is worth it. You should not expect a Joel Robouchon-style butter fest but a delicious, fluffy mash with silky smooth texture. You know it’s good when you go to a specialty steak house and the potato mash still gets a special mention every single time, right? Now the good people at Cestr, or, more precisely, Mr Lukas Drab, Cestr's sous-chef, have published the recipe for their famous mash in the monthly magazine issued by the Ambiente group of restaurants (which include Cestr). Just in time for the Thanksgiving dinner preparations. What a coincidence! Now if you want to be the star of the Thanksgiving family dinner, or if you just want to prepare a really good potato mash, read on. We are reprinting the recipe with the original photos, which we kindly given to us by the management. The key to the recipe is following the instruction, and not counting the calories! 1 liter (34 oz) milk. The potatoes will cook in milk, so you should have enough milk to cover the potatoes in the pot. We are talking about whole (full-fat) milk, preferably organic. a bit of salt. The exact amounts of butter and salt may vary and you should adjust them to your taste. It all starts with the selection of the right potatoes. Here’s the rule of thumb: they should be good. Go figure, right? They should be firm and not too starchy, and should be free of sprouts. They do tend to change the selection of the exact variety at Cestr, so you don’t have to worry about that very much. Our guests did not get to taste the mash during the summer. The explanation is simple: new potatoes are not suitable for the mash, since their higher water content will break the texture. That is why they wait for about two months in the summer and then start making the mash again only when the potatoes are ready. 1. First of all, peel the potatoes and soak them in water to get rid of the starch. At Cestr, they soak the potatoes over night, but half an hour will do in household conditions. 2. Cut the potatoes to smaller cubes and cook them in water for about 5 to 10 minutes, continuously scraping off any starch foam that is created on the surface. 3. Get rid of the water and simmer the potatoes in hot milk. The milk should be hot, not cold. (Cold milk will stop the cooking process and that’s bad for the mash). The milk should simmer, not boil. The more fatty the milk, the easier it burns at the bottom of the pan. Cook the potatoes until very soft for 25 minutes or so. 4. Drain the potatoes, keeping the excess milk of later use. 5. 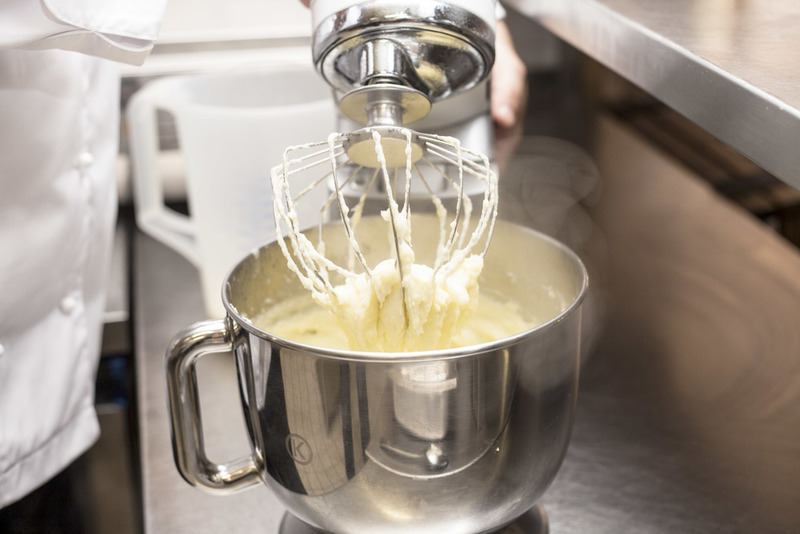 Put the potatoes in a mixer bowl, add butter, and start mixing with a whisk. First whisk without any milk and start adding the milk later to achieve a silky texture of the milk. The amount of milk needed may dramatically vary depending on the variety of the potato used. Finally, a word about salt: Salt is added when the potatoes simmer in milk, and then again when the mash is being whisked. We hope you will enjoy the recipe!!! If you do follow it (and we hope you will), please comment on the results and do post pictures of your mash! Happy Thanksgiving! As we get asked to recommend restaurants focusing on Czech cuisine all the time, here are a few of our favorite places to eat Czech food in Prague. Jahodové knedlíky – scrumptious dumplings packed with strawberries, coated in butter and mouthwatering strawberry sauce. You will love them all!